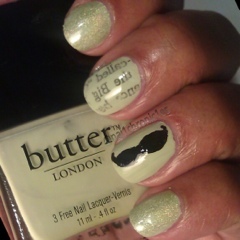 Thanks to Lacey over at Lace and Lacquers for the indirect reminder I had not donned a mustache for Movember. Even with the reminder I almost forgot to share my creation. Movember raises awareness and money for men's health issues, specifically prostate and testicular cancer, through the growth of mustaches. I'm not a fan of the upper lip hair (now if they find a month for beards...yes Lawd) but who could be mad at the cause? Anywho here's my contribution. 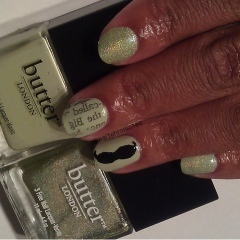 I used Butter London's Bossy Boots and Trustafarian, a beautiful holo from their Fall 2012 collection. I went with newspaper accent, well prostate...bathroom essential for men... you get the picture.